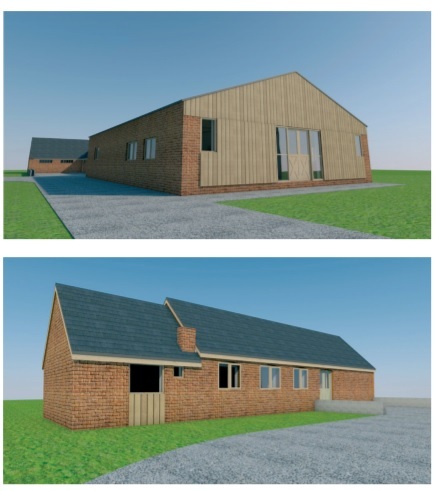 Our client requested our assistance in obtaining planning permission for the conversion of agricultural buildings to residential under Permitted Development (Class Q). Two of the buildings are traditional brick barns with pitched tiled roofs and the third is a steel portal framed building with brick walls and a corrugated roof. The conversion of a barn (barn A) into a dwelling was first refused in 2004 and at appeal in 2005. Since then the General Permitted Development Order has come into effect with the purpose of bringing redundant buildings back into use. When the Government revised the GPDO to include the conversion of agricultural buildings to residential use, it presented an opportunity to convert these barns using a specific National Policy. Demolition Consent was approved in 2013 to remove the agricultural buildings in close proximity to the barns. Class Q (a) was subsequently approved in December 2015. The agricultural buildings were in an isolated location and therefore contrary to paragraph 55 of the National Planning Policy Framework. Agricultural buildings used for farming enterprise located in close proximity to the proposed buildings for conversion. Having submitted the GPDO for the conversion of the barns, Burton Green Parish Council made no objection. The Case Officer made a couple of requests regarding changes to window materials and design which were then amended in the plans. The applications were approved without further question, thereby granting approval for the conversion of three buildings that had been refused just two years prior. The Planning Specialist was Natasha Blackmore da Silva MSc. Click here to view or download the case study.